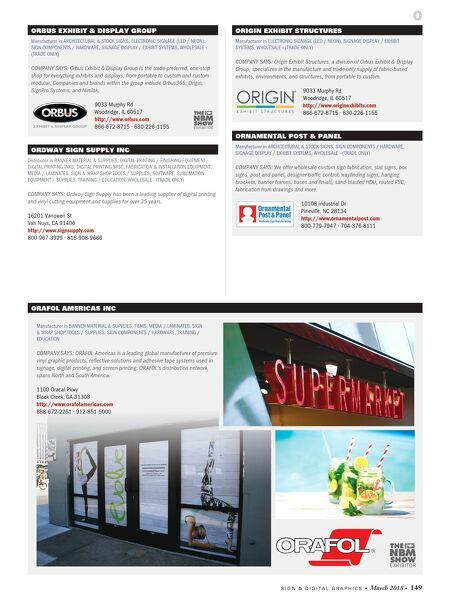 148 • March 2018 • S I G N & D I G I T A L G R A P H I C S OPTEC DISPLAYS INC Manufacturer in ELECTRONIC DIGITAL SIGNAGE, ELECTRONIC SIGNAGE (LED / NEON), WHOLESALE - (TRADE ONLY) COMPANY SAYS: Optec Displays uses multiple in-house teams to innovate, create and deliver the highest quality products, services and support. 1700 S De Soto Place Ontario, CA 91761 http://www.optec.com 800-876-1668 ∙ 626-369-7188 OPTIVA SIGNS Manufacturer in ELECTRONIC SIGNAGE (LED / NEON) COMPANY SAYS: Optiva, a division of iLight Technologies Inc., is a pioneer and leader in innovative LED illumination solutions that transform, excite, and energize corporate identities and architectural environments worldwide. 118 S Clinton # 370 Chicago, IL 60661 http://www.optivasigns.com 312-568-5760 SEE ORAFOL AMERICAS INC'S LISTING ON PAGE 149 OMAX CORP Manufacturer in CNC ROUTERS (XYZ), SOFTWARE COMPANY SAYS: Our mission is to provide precise, easy-to-use, cost-effective, standardized, reliable, and high-quality abrasive-jet machining systems to the manufacturing industry, with strong after-sale services. 21409 72nd Ave S Kent, WA 98032 http://www.omax.com 800-838-0343 ∙ 253-872-2300 OMNIPRINT INTL Manufacturer/Distributor in DIGITAL PRINTING / FINISHING EQUIPMENT, DIGITAL PRINTING INKS COMPANY SAYS: OmniPrint International offers the latest direct to product printers, DTG printers, direct to garment inks and DTG RIP software to enhance your business. 3505 Cadillac Ave # F3 Costa Mesa, CA 92626 https://www.omniprintonline.com 855-373-3538 ONYX GRAPHICS INC Manufacturer/Distributor in SOFTWARE, TRAINING / EDUCATION COMPANY SAYS: Onyx Graphics is dedicated to helping customers increase productivity, reduce costs, and gain a competitive edge with superior print and color quality with market-leading workflow, RIP and special edition software for the wide-format printing market. 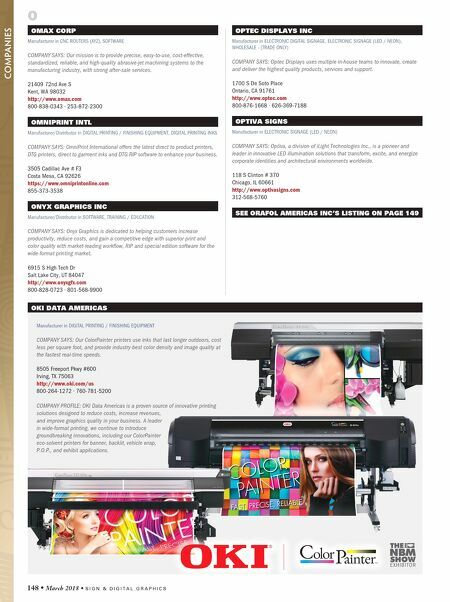 6915 S High Tech Dr Salt Lake City, UT 84047 http://www.onyxgfx.com 800-828-0723 ∙ 801-568-9900 O COMPANIES OKI DATA AMERICAS Manufacturer in DIGITAL PRINTING / FINISHING EQUIPMENT COMPANY SAYS: Our ColorPainter printers use inks that last longer outdoors, cost less per square foot, and provide industry-best color density and image quality at the fastest real-time speeds. 8505 Freeport Pkwy #600 Irving, TX 75063 http://www.oki.com/us 800-264-1272 ∙ 760-781-5200 COMPANY PROFILE: OKI Data Americas is a proven source of innovative printing solutions designed to reduce costs, increase revenues, and improve graphics quality in your business. A leader in wide-format printing, we continue to introduce groundbreaking innovations, including our ColorPainter eco-solvent printers for banner, backlit, vehicle wrap, P.O.P., and exhibit applications.